Your disc label artwork should be provided as an electronic file matching one of our three templates. 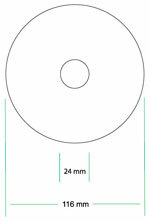 The Standard CD label template is used for basic disc label designs. 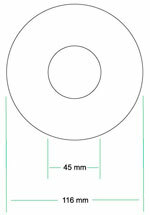 The art dimensions are 116 mm for the outer edge and 45 mm for the inner edge. The image area extends from the edge of the disc to the outer edge of the mirror band. The Extended Image CD label template provides for a larger disc label image area. 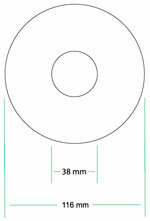 The art dimensions are 116 mm for the outer edge and 38 mm for the inner edge. The image area extends from the outer edge of the disc to the inside edge of the mirror band. Because the art extends over the mirror band it is recommended that type and small graphics do not extend over the mirror band unless a solid background is added to cover the mirror band. The Maximum Image Area CD label template provides the largest label size. This layout is used for most Full color offset printed CDs. A white layer is printed and then the four color process colors are printed over the top of the white layer. The art dimensions are 116 mm for the outer edge and 24 mm for the inner edge. For CMYK images we strongly recommend offset printing over a white background. Images with screens, blends, and halftones generally look best when printed using the offset printing process.